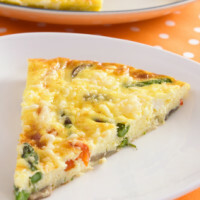 Home » Recipes » Meals » Recipe: Super Strata! So, I am no foodie. I don’t even own a cookbook, but I DO love the strata! It’s one of those night-before prep dishes if you want it to be. You can pack so much goodness in this dish, your children will get a surprise in every bite. Eggs are a brain food, veggies are rich in vitamins and minerals, and whole grains are a source of fiber and fullness! It can be a breakfast, lunch, or dinner and reheats really well. In a large bowl, whisk together eggs and milk. Add in cheese and basil. Season with cayenne pepper and black pepper. Create layers (that’s why it’s called a STRATA!) with the bread on the bottom, then veggies, then custard, and repeat once. Cook for 45 minutes or until internal temperature reaches 160 degrees. Nutrition Facts: Each serving contains about 300 calories, packed with 20g protein, and 1 1/2 cups of veggies! Comment on Recipe: Super Strata!